Provence, Blues and Sewing Machines | OccasionalPiece--Quilt! Posted on June 12, 2010 by Elizabeth E.
The French fabrics have arrived and they are beautiful. But this was yesterday’s work: cutting 250-plus 6″ blue squares (5 1/2″ finished). Of course, I was delayed in the forward progress by running off to a couple of quilt shops to see if they had something to add to this melange. That’s something I used to do a lot before Professoring and before the Internet. I used to make the rounds, collecting colors, shades, patterns and I have to say it was a thoroughly enjoyable process. There’s something unique about being involved with the tactile when selecting fabrics–the feel of the cloth, the hand, whether they are a rough texturey linen or a smoothly woven cotton. Heading to a fabric store is also about the hunt: what will I find? In yesterday’s case, not much. That makes me glad that the internet exists, as in the case of the ability to find–and purchase–the French fabrics. We have our region’s Quilters Run next weekend and both stores were slicked up in their Sunday Best, ready for the hordes. All the bolts were lined up, edges folded in, notions arranged, with a variety of quilts on the wall or artfully draped over the displays. 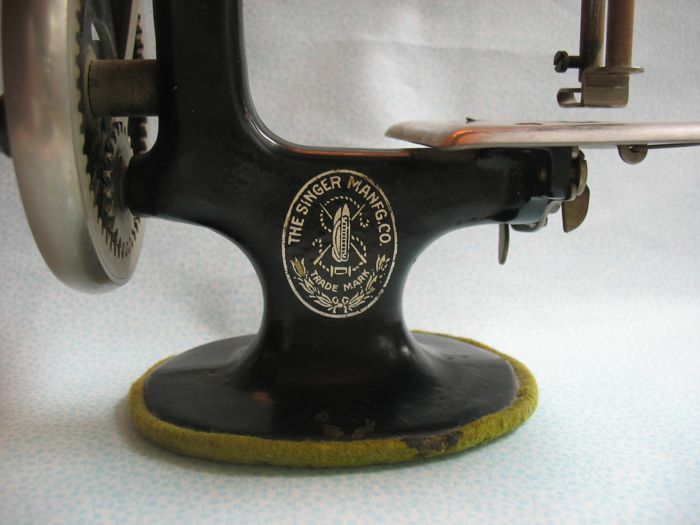 In one corner of one store was a display of Featherweight machines of all kinds, as well as some vintage toy Singer sewing machines. 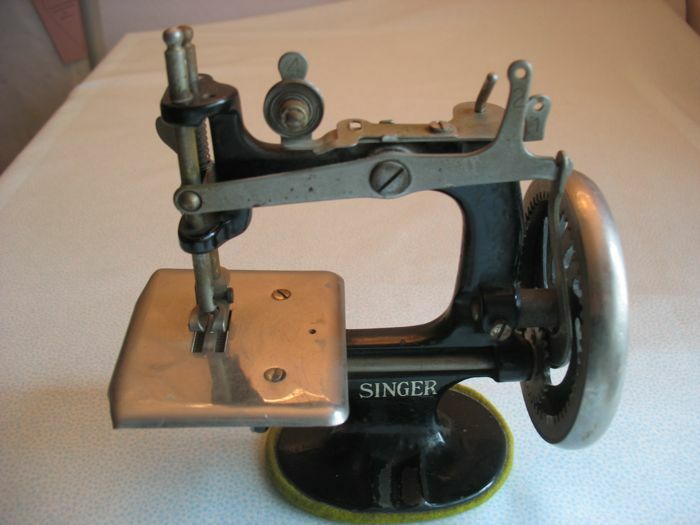 It reminded me of the toy Singer Sewing Machine machine that my mother used to play with and which she gave it to me a long time ago. This one’s not as shiny or gussied up as the ones in the store but it has nice quality that those don’t others don’t: a remembrance of my mother. But I did catch a look at the price they wanted for theirs: $145.00. 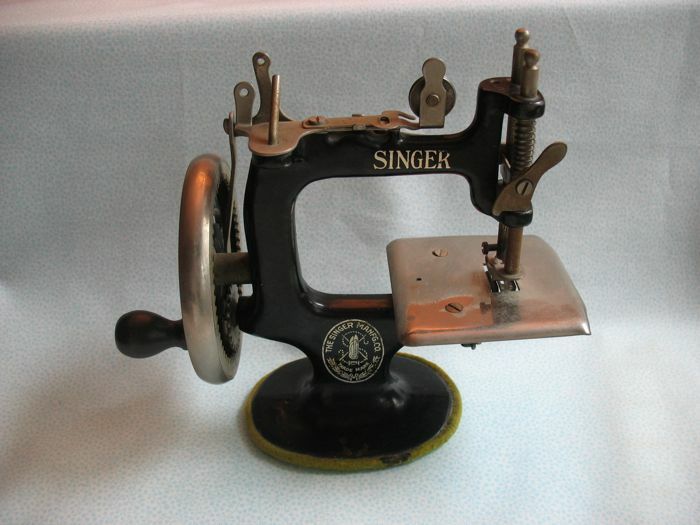 A non-toy Featherweight Singer sewing machine like the one I have (which I purchased at a garage sale) now goes for $495.00. I told Dave that it’s nice to know that some of my treasures accrue in value without me doing anything but hanging out, living, and getting older. I’m going to resist any gags about how they’re gaining in value as opposed to what’s happening to me, as I hang out, live and get older. Wow! Our fabrics have found an amazingly talented home! Thanks so much for sharing the before, middle and soon to be “after” of your project! Hope to see it hanging at Road 2011!